Perfect to highlight your favourite plant, it'll bring a touch of class to your garden. 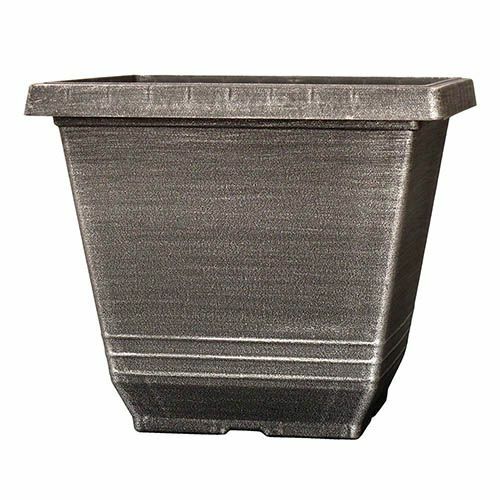 This metallic, silver finished square planter is simple and elegant and will fit perfectly into any garden – big or small, traditional or contemporary. Suitable for a wide range of planting, it'll add a decorative touch without overdoing it. Plant up bedding and bulbs or why not try a small standard tree or dwarf shrub that will add height and structure to your patio, terrace or even balcony displays! Made from heavy duty plastic that is both UV stable and weather resistant, it's durable and can be reused year after year. Supplied as a single planter with a diameter of 20cm (8in). Supplied as a single pot made from a durable UV-stable and frost-resistant plastic, and hand painted with a silver metallic finish.